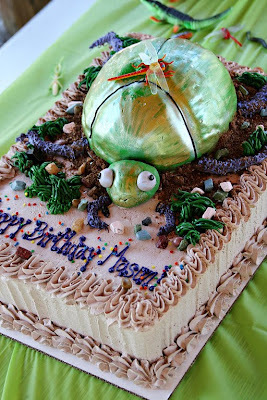 Frogs and Snails and Lizard Tails…. that’s what little boys are made of! 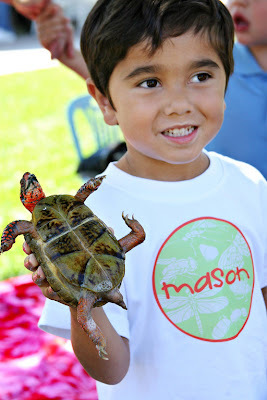 My son, Mason, has always loved “creepy crawlies”. He has a fascination (bordering on obsession) with the little creatures…and could spend hours searching for, capturing and observing any type of insect, reptile or amphibian. 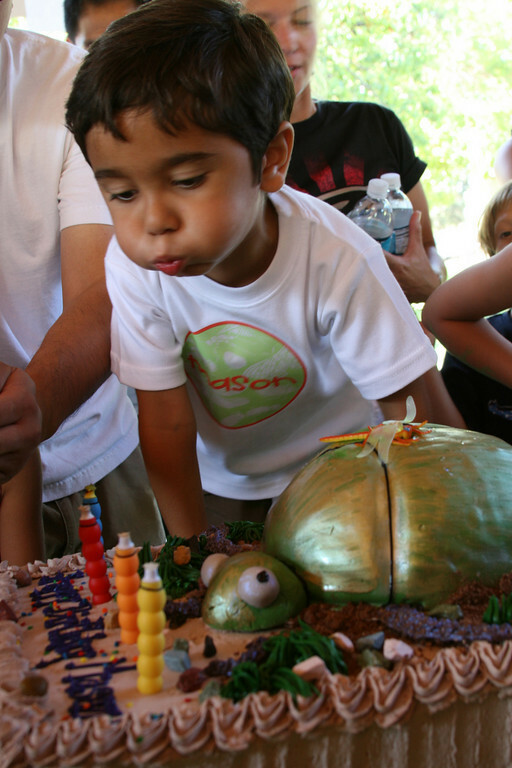 So coming up with a birthday party idea for Mason’s 4th birthday was a no-brainer. My nephew, Tyan, had a reptile party for one of his birthdays a while back…and he loved it so much that he asked for the same party the very next year! 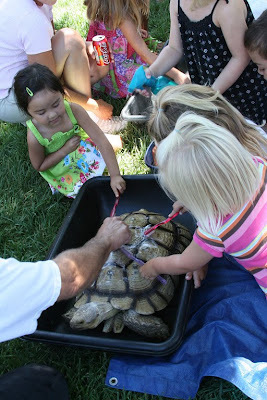 Having done two bug/reptile parties in the past, we already had lots of great ideas to work from. This was really one of the easiest parties we’ve done. (All photos by Lot116 Photography). 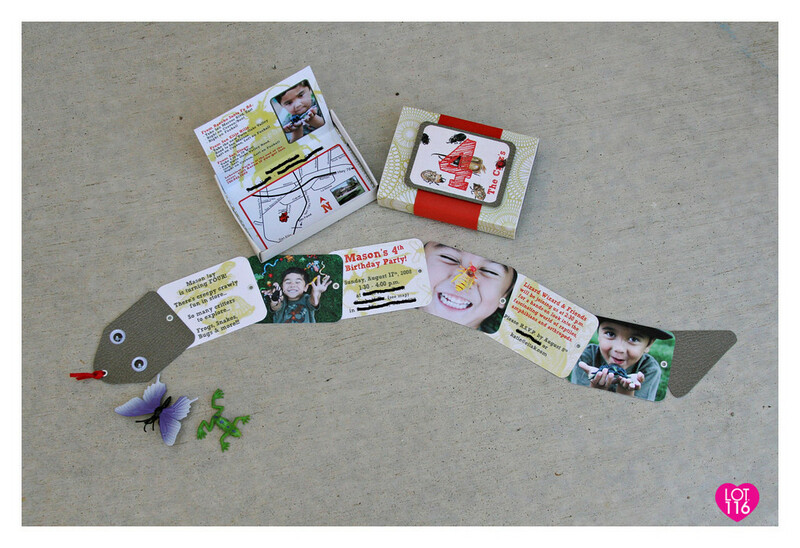 INVITATIONS: I pretty much followed the exact same format I had done for Tyan’s reptile party invites: a segmented “snake” with all the party information and pictures printed on separate cards and then hand-assembled using eyelets. Each snake’s head had googly eyes and a ribbon forked tongue. 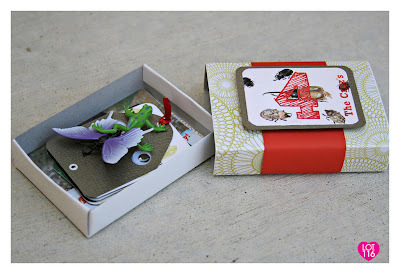 But for Mason’s version, I went a step further and packaged the snakes in matchboxes that were hand-lined and wrapped with coordinating papers, and included a few plastic creatures. I remembered some stories from my childhood of treasured pet crickets that were kept in little matchboxes and that was my inspiration for the packaging. 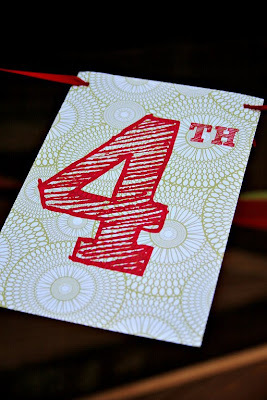 The hardest part of creating the invitations was narrowing down the pictures to use! That’s the “problem” with having a professional photographer in the family! My sister, Julie, of Lot116 Photography took so many adorable shots, that I simply couldn’t choose one or two. I ended up using 10 -12 pictures (the second side of each card has a different photo of Mason)! 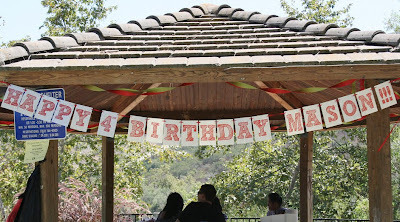 DECORATIONS: We decided to have the party at a local park…which worked out wonderfully. I paid a nominal fee for a use permit to reserve the gazebo and location for my party. Having the party somewhere else, instead of at home, made it so much easier. Other than making sure that I packed everything I needed into our cars the night before, it was really a piece of cake to prep for this party. I didn’t have to spend a lot of time cleaning up and decorating my house. And because the party was at a public park, we didn’t need to go overboard on decorations. We kept it pretty simple: a banner, some streamers, and coordinating plastic tablecloths and napkins. 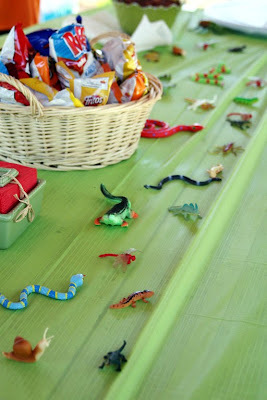 We sprinkled plastic bugs and reptiles on all the tables around the food. The park was really beautiful, clean and fairly private…with a playground, covered gazebo, plenty of grass and trees, and a water feature. It was a perfect place for an outdoor party in mid-August. FOOD/CAKE: We went with a picnic style set up for the food. With the help of my mother-in-law and my sisters, we packaged up all the food and snacks in portable, grab-n-go containers. We did different varieties of peanut butter and jelly sandwiches cut in half (some with crusts off) in small sandwich bags. Another option is to cut the sandwiches in fun shapes and pack them in small wax paper, glassine or parchment pastry bags. If you want to get extra fancy, you can actually print a coordinating design onto the paper (not the wax ones) pastry bags (I’ve done this for clients at weddings for freshly made donuts and pastries). Because of the heat (and flies…yuck) of mid-August, I decided to keep all the food in coolers and not display or serve them on the tables. Each cooler had a sign describing the contents. The coolers were placed at the ends of each table under the gazebo. 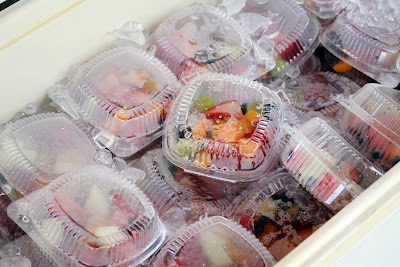 We had cut up fruit bowls – packaged in the clear plastic clam-shells that you can get at Smart & Final, PB&J sandwiches, pizzas (delivered), small bags of chips, individual-sized containers of pudding and Go-gurts, juice boxes, sodas, waters…and Jeff (of Rhino Cake Company) made two delicious pasta salads (one Greek and one Asian, so no mayo). 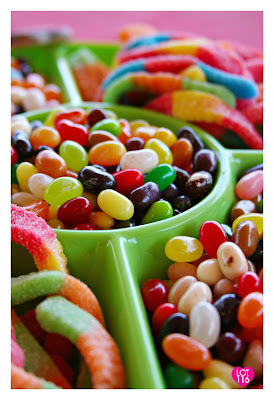 We also had finger foods and candies on display at each of the tables….such as “ants on a log” (raisins on peanut butter-filled celery stalks), gummy worms, Jelly Belly jelly beans, Red Vines red and black licorice. ACTIVITIES/GAMES: Since the party was held at a public park, I really didn’t have to organize many games or activities. 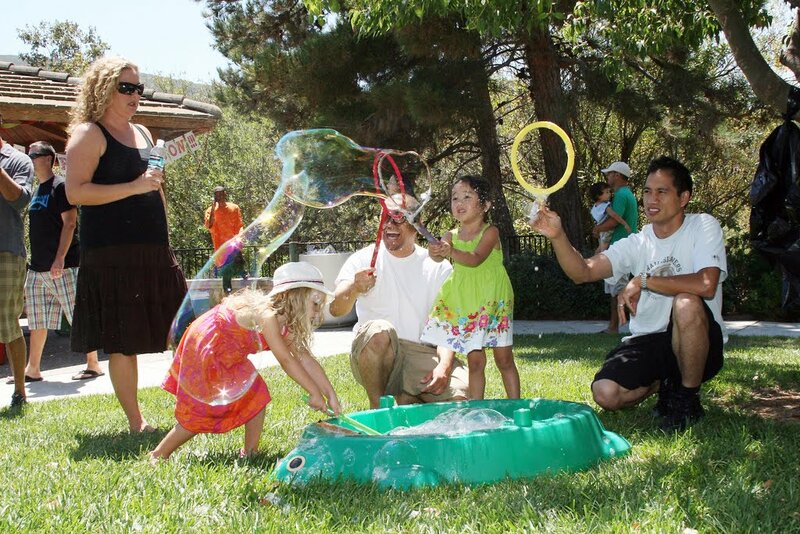 With a playground, a water feature, lots of grass to run around on and a special guest booked for entertainment…there was plenty for the four year-olds to do. My husband and brother-in-laws mixed up a super concoction of bubble juice and filled a small kiddie pool with it. 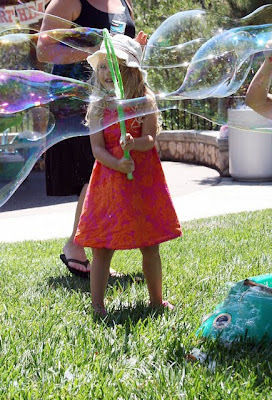 We had some homemade bubble wands (badminton rackets, bent hangers, plastic rings) and let the kids go to town making giant bubbles. The adults had fun with this too. I also offered face painting (custom painted ANYTHING by yours truly) and my niece, Maylie, and Jeff’s daughter, Makala, were put in charge of tattoos (bug ones ordered from Oriental Trading Co.). But my favorite part of the whole party…and the easiest…was our “special guest”. For entertainment, I simply booked the Lizard Wizard and it was the highlight and main event of the party. 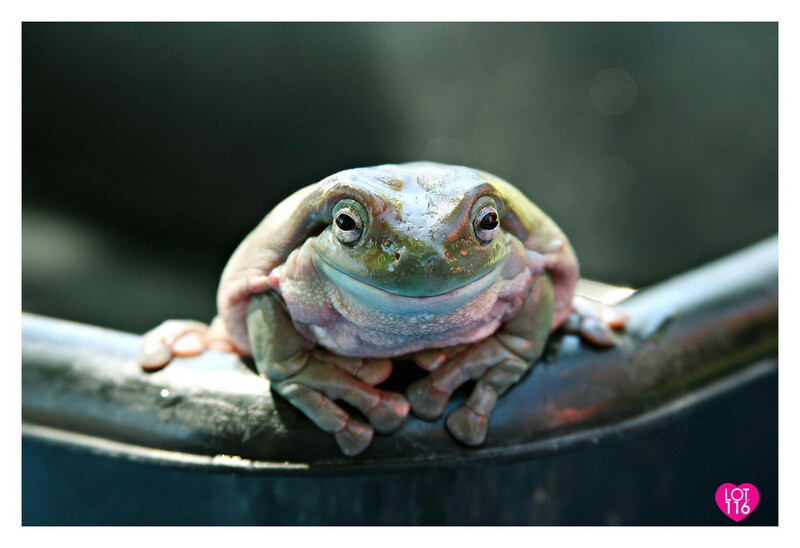 The Lizard Wizard is FANTASTIC and gives a fun, educational and hands-on show with their amazing collection of tame and fascinating reptiles, amphibians and arthropods. 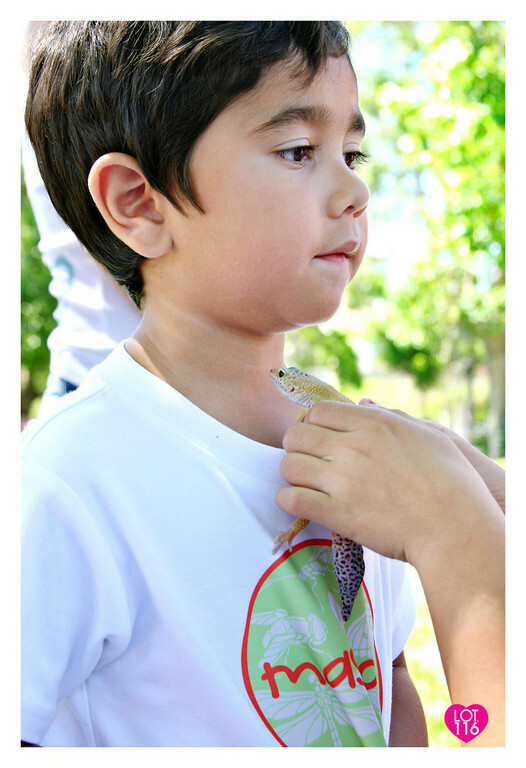 The kids had a blast holding snakes, bugs, lizards…even a tarantula and a crocodile! My niece, Maylie, with a tarantula hair decoration. 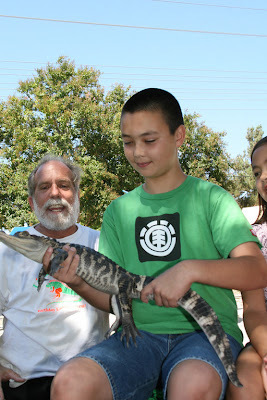 My nephew, Tyan, with the crocodile. 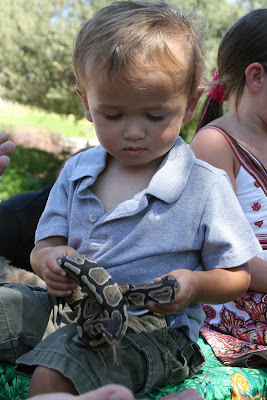 My little one, Isaac, with a red-tailed boa. 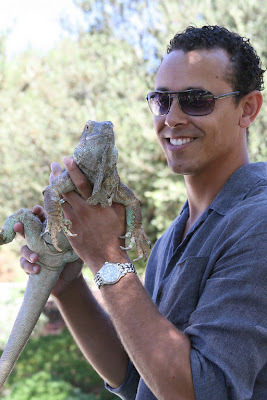 My husband, Aaron, with an Iguana. My niece, PJ, giving the tortoise a scrub. 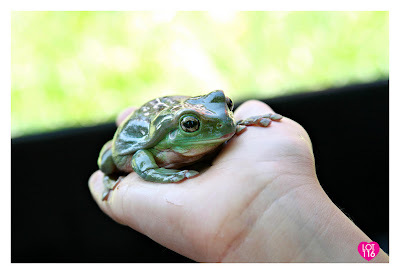 and holding all the little frogs and toads. 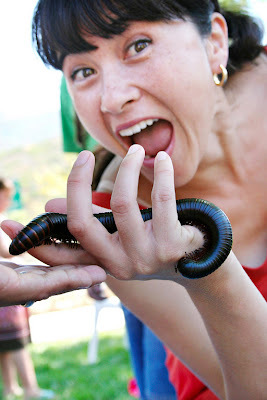 Me, looking crazy with a huge millipede. 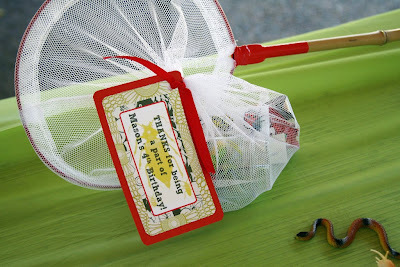 FAVORS, GOODIE BAGS, THANK YOUS: The favor bags were also super easy. I knew I was doing a bug theme several months before I even designed the invites to Mason’s party. So when Target’s $1 section had their seasonal spring goodies, my sisters (who are always scouting out items for me in anticipation of the next party), bought up as many of the butterfly nets they could find. I usually need about 35 favors, so Mary found some in the Temecula store, and Julie found some at our local Targets. Tied inside the bug nets were assorted goodies: more plastic creatures, a plastic bug catcher – the kind with holes in the magnifying top (from Oriental Trading Co.), bug-themed tattoos and stickers, bubbles, and “bug” fruit snacks. Oh, and on another note, Julie had Kat over at Clarabelle & the Hen (formerly Kat in the Hat Designs) make Mason a personalized bug shirt to wear at his party. It was so cute and matched the colors and theme perfectly. For the thank you notes, I designed a personalized card with the photos Julie took of each child and his/her moments at the party with the snakes, lizards, frogs and turtles. Everyone loves these custom notes because it’s not only a thank you card, it’s also a mini memory book of how much fun their child had at the party. The photo on the front of the thank you note featured most of the kids holding the big boa at the end of the Lizard Wizard’s show. 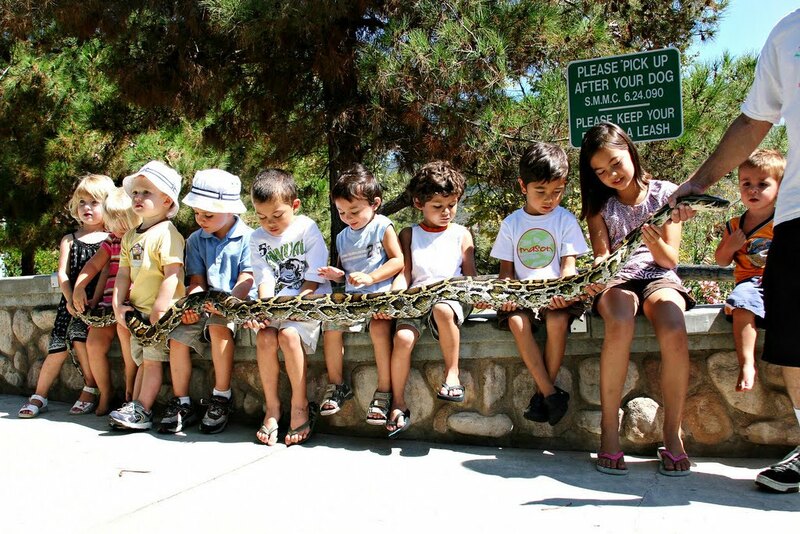 I love this picture because of the look on the kids’ faces as the snake is being brought over…. 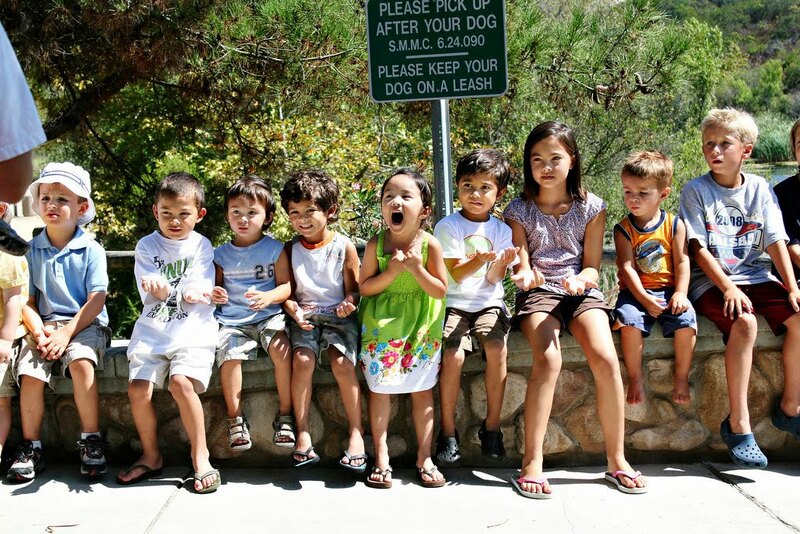 And notice that my niece, PJ (green dress above), is no longer in the shot! Too funny! 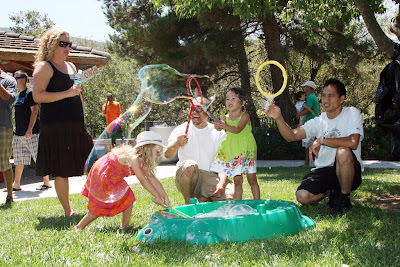 Kristin – The Lizard Wizard is great…we've used them for three of our family parties and the kids always have a great time, learn a lot, and it's very hands-on. Have a great party! Hi I'm planning a party for my son's 4th and was wondering what you thought about the Lizard Wizard. I would love to have something like that for entertainment. 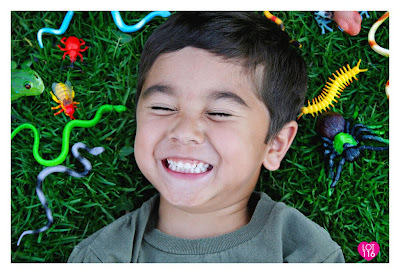 All the plastic bugs and reptiles were purchased from in bulk from Oriental Trading Company and Rhode Island Novelty, but I also found some in smaller quantities at Target and The 99 Cents Store. Thanks for posting! 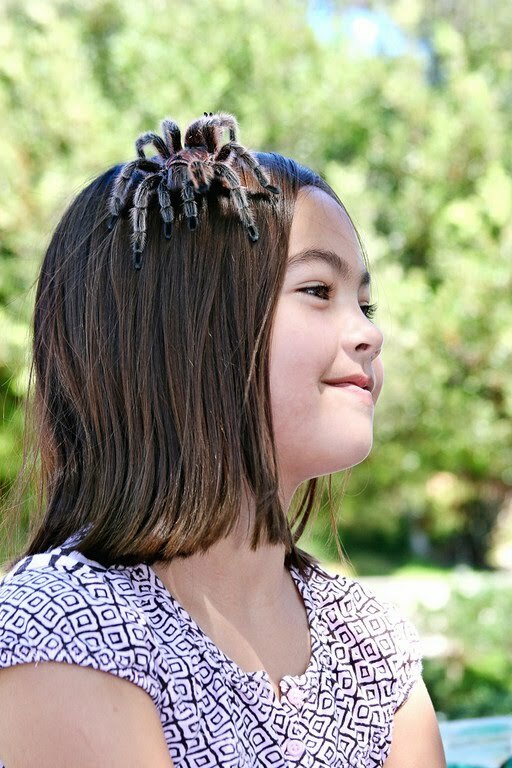 My dAughter is into bugs and reptiles. She particularly loves ladybugs. Where did u purchase the plastic bugs and reptiles? I *love* this. Searched for bug and reptile part ideas (planning my son's 5th) and found your post. It's fabulous and so well done.